Gabbar Is Back, the remake of the Telugu hit Ramanaa, reprises Sholay imaginatively. Its hero is named Gabbar, after the evergreen villain of India’s greatest hit ever. This is going to be a major attraction, as the iconic lines are modified for the hero, and are likely to be loved in the new form. 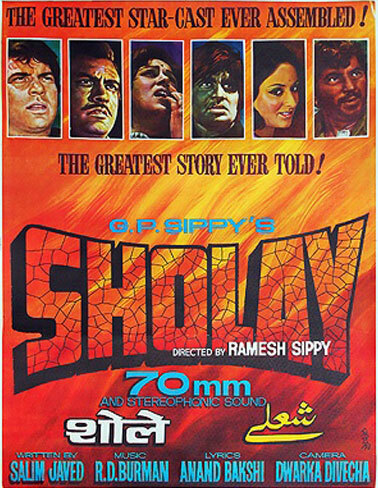 Sholay (1975) was India’s greatest hit, and ‘hatched’ all grades of copies and rehashes. Never mind if the film itself was inspired both by The Seven Samurai and The Magnificent Seven, with inspired sequences from several other foreign films, and had Indian inspiration too from Raj Khosla’s 1971 Mera Gaon Mera Desh, including a climactic song in the dacoit’s den and a villain named Gabbar Singh (instead of Vinod Khanna’s Jabbar Singh in the original). Dharmendra, production designer Ram Yedekar, lyricist Anand Bakshi and singer Lata Mangeshkar were other common points. And while Amjad Khan finally bagged Gabbar’s role, his real father, veteran Jayant, played a key positive role in the 1971 drama. But these were all made before this classic. 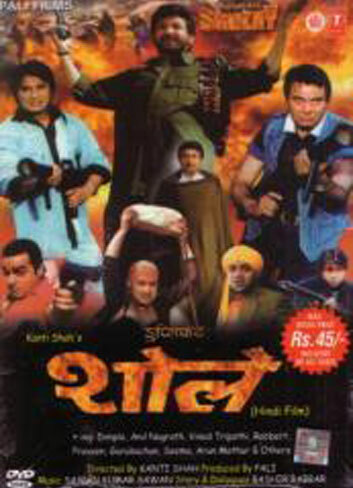 Let us now look at what came after Sholay. 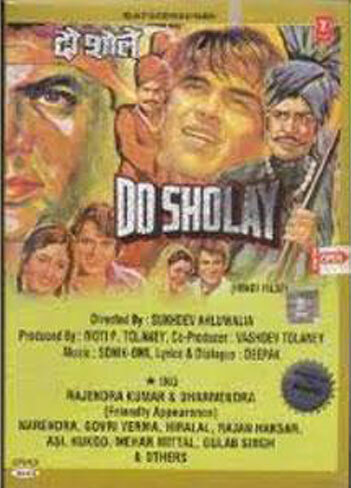 This film even had a large-hearted Sholay hero Dharmendra making a cameo! Otherwise, it was a nondescript B-grader! A cleverly disguised remodeling of Sholay, the film saw Thakur (Sanjeev Kumar) converted into Dada Thakur (Dilip Kumar), who wants to avenge his family’s destruction at the hands of terrorist chief Dr Dang (Anupam Kher). He enlists prisoners on death row (Anil Kapoor, Jackie Shroff and Naseeruddin Shah) to fulfill his mission. As with Jai and Veeru in Sholay, the three have personal agendas, but reform when they come to know the truth. Subhash Ghai made this magnum opus in 70mm and Stereophonic Sound just like Sholay and also loaded it with super-hit music. Coincidentally, Ghai’s pet lyricist Anand Bakshi came in and so did singer Kishore Kumar in common with the original. The non-star-cast comedy ingeniously incorporated Gabbar’s daughter, who studies abroad, ignorant of her dad’s real occupation and an imposter of Gabbar who is killed by the real villain when he leaves jail after 17 years. Gabbar is now an extortionist. 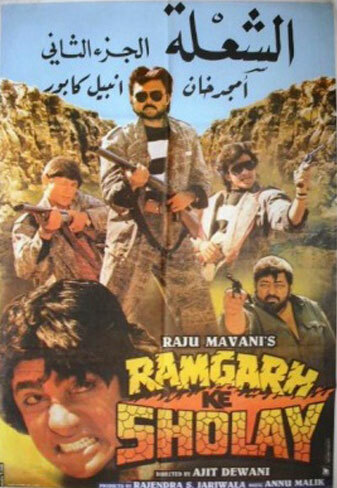 After watching Tridev (the 1989 super-hit), a talkative village girl who lives in Sholay’s hamlet of Ramgarh (like Basanti), writes to film heroes to come and fight Gabbar. Instead come some duplicates of film stars who are themselves on the run from the police! The highlight was that Amjad Khan himself reprised the roles of the real and fake Gabbar! Audience response: The film was a sleeper success! The B-grader was another convoluted comedy. 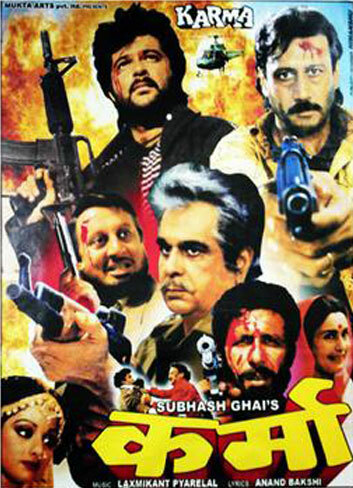 RGV fulfilled his craving for remaking Sholay and Amitabh Bachchan his wanting to essay Gabbar’s character in this aberrational version of Sholay set in Mumbai’s underworld! Each and every element in this unbearable film was a sordid regression of the original—the violence, the characters and acting, the script, music and direction. The tangewali Basanti of Sholay was replaced by a lady rickshaw driver and the love stories of the two heroes in the original were reprised. 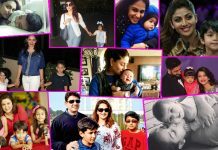 Helen’s dance had a counterpart item song by Urmila Matondkar, and liberal snatches of R.D. Burman background score were used throughout. – Rajiv Vijayakar, a Senior Journalist, Film & Music Critic and Historian for Hindi cinema and Film Music is also an Author and Twice Jury Member at 58th and 62nd National Film Awards.